Can IQ Tests Really Predict Your Success In Life? Dozens of online intelligence tests promise to measure intelligence and even to predict a person’s future success. Most of these online quizzes are not supported by research. Instead, psychometric testing typically relies on Intelligence Quotient (IQ) tests. These include the Weschler Adult Intelligence Scale, the Multidimensional Aptitude Battery, and the Kaufman Brief Intelligence Test. These tests purport to measure a person’s general intelligence (also called the G factor). Many people believe general intelligence is a predictor of success. Yet research suggests IQ is just one of many factors that plays a role in a person’s success. Successful relationships with others. This might involve a happy marriage and many friends. Financial success. This could include the ability to pay bills, save for the future, and make large purchases. Career success. This might mean succeeding in a career, such as law or medicine, that others view as prestigious. Or it could mean finding a career that is personally satisfying or challenging. Academic success. This can involve earning an advanced degree, making excellent grades, or getting a scholarship. Success as a parent. This might mean having close relationships with children, raising children who succeed by several measures, or simply enjoying parenting. Feeling happy. This could involve achieving a sense of meaning or inner peace. Moral success. This might mean feeling like a good person, finding ways to help others, or following the dictates of one’s faith or conscience. IQ scores cannot measure every type of success. In fact, it is difficult for IQ scores to fully and accurately measure even a single type of success. While there is some correlation between IQ scores and financial or career achievement, even these categories are broad and nonspecific. Individuals can have different goals for the same category. For example, one person may have a low-paying job that they find personally fulfilling. Another person with a high-status job might develop workplace issues like boredom or burnout. A handful of studies have found a modest correlation between IQ score and success in the workplace. For example, a 2004 study found that IQ is a good predictor of both a person’s ultimate career level and their success within that field. People with higher IQs tend to occupy more prestigious careers and to excel in those careers. The study theorizes that this is because people with high IQs can master new skills more quickly. In highly demanding fields—medicine and law, for instance—the ability to process and retain new information is key. Various studies have shown IQ correlates with income, but the extent to which this is true varies significantly. In a 2007 review of research on IQ and income, most studies found low to moderate correlations between income and IQ. IQ was about as good of a predictor of success as parental socioeconomic status. Willingness to learn new information. Social class (whether one comes from wealth or poverty). Access to economic and social resources, such as quality schools. Institutional discrimination, such as racism, sexism, and homophobia. Individual discrimination, such as discrimination by a biased teacher. The correlation between IQ score and socioeconomic status suggests IQ tests may measure access to opportunity rather than innate qualities. IQ scores correlate fairly well with socioeconomic status (SES). This is not necessarily because people with high IQs make more money. Instead, research suggests greater social and economic privilege afford children access to tools that improve their IQ. For example, research published in 2011 found a heritability rate for intelligence of just 5% among children of low SES. Heritability measures the extent to which differences between individuals can be explained by genetics. A 5% heritability rate means nongenetic factors explain 95% of intelligence differences. Experiences like food insecurity or homelessness are more likely to affect an impoverished child’s IQ than their biology. Move to areas with excellent schools or put children in gifted education programs. Connect children to adults who can help them master new skills. Spend time with children on intellectually challenging tasks such as building blocks, completing puzzles, or reading. Research also points to a class bias in IQ tests. Children raised in households with lower socioeconomic status participate in fewer conversations and hear fewer words than children from more privileged backgrounds. Middle and upper-class children who take IQ tests are more likely to have heard the words and been exposed to concepts on the test. Critics argue this trend biases tests against poorer children, measuring their experiences rather than their raw reasoning skills. Other people claim this bias actually makes IQ tests a more reliable measure of success. They argue these tests measure cultural knowledge that may affect a child’s ability to fit in, understand the world, and ultimately succeed. A significant body of research questions the validity of IQ scores as a measure of intelligence. Some researchers are skeptical of the very notion of general intelligence, which is what IQ tests purport to measure. IQ tests may also discriminate against certain groups. Many early IQ tests are now widely acknowledged to have been biased, perhaps even by design, against people of color, women, and other marginalized groups. Today’s IQ tests are not deliberately discriminatory but may still be biased. IQ tests may inadvertently test not for intelligence, but for cultural knowledge that dominant groups are more likely to have. Groups historically exposed to oppression can also experience stereotype threat when taking standardized tests. When a person is exposed to stereotypes about their group, their stress levels may rise. Anxiety in turn can undermine their performance. 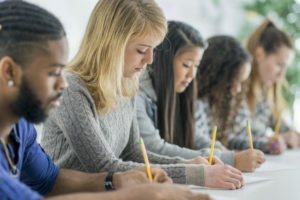 Even something as seemingly innocuous as filling a demographics survey before taking a test may activate stereotype threat. G, the “general intelligence” IQ tests measure, is just one way to assess intelligence. Researchers, teachers, and mental health professionals have identified numerous other forms of intelligence. Visual-spatial intelligence: the ability to visualize objects and navigate spatial relationships. It may be used in drawing, solving jigsaw puzzles, or designing buildings. Intrapersonal intelligence: the ability to know and understand oneself. Interpersonal intelligence: the ability to understand and relate to others. Musical awareness: the ability to recognize patterns in tone and rhythm, to express oneself through sound. Linguistic intelligence: the ability to use words effectively, such as through writing a persuasive essay or beautiful poem. Logical-mathematical intelligence: the ability to do logical problem-solving. It may be used in math and computer programming. Bodily-kinesthetic intelligence: the ability to use the body effectively in activities such as dancing and playing sports. It often includes dexterity, balance, and other skills. Existential intelligence: the ability to tackle questions of existence and spirituality. Naturalistic intelligence. the ability to work well with animals, recognize plants in nature, and so on. According to Gardner, most people are competent in a few areas, with limited skill in others. It’s very unlikely that anyone could show total mastery in all nine areas, undermining the notion of a true general intelligence. Other researchers divide intelligence into IQ and EQ, or emotional intelligence. EQ measures one’s ability to recognize and respond to emotions, both in oneself and others. Someone with high emotional intelligence can use their understanding of emotions to work well with others. Much research suggests the ability to understand and cooperate with others may predict success in multiple areas of life. Even in intellectually demanding careers, emotional intelligence is often necessary. For example, a 2014 study shows emotionally intelligence correlates with the success of medical students. According to the study, the ability to regulate one’s emotions was an especially significant predictor of success. The study even recommends medical schools use emotional intelligence measures on their applications. A 2010 study found the ability to regulate emotions was a predictor of higher income and socioeconomic status. It also predicted greater overall well-being. People concerned about their intelligence or their path to success can find significant help from therapy. In a limited number of circumstances, therapy can even help someone feel smarter or perform better on an IQ test. For example, a person with testing anxiety may reduce stress through therapy. Likewise, a person who struggles with motivation or impulsivity may learn more effectively after tackling these issues with a therapist. Help a person identify barriers to success at work or in their relationships. Strengthen a person’s emotional and social intelligence, helping them collaborate more effectively. Move beyond impostor syndrome, chronic feelings of inadequacy, and other forms of low self-esteem. Define what success looks like, then set specific and actionable goals for achieving success. A licensed therapist can help you feel smarter and more successful. Find a therapist today!